Love eclectic interiors? You’ve come to the right place. 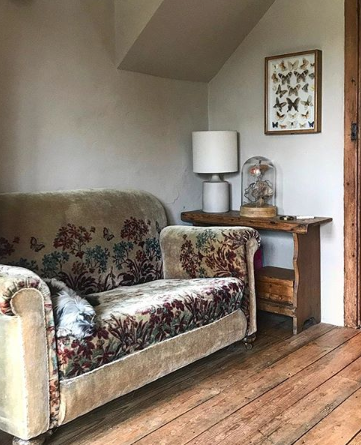 ‘Susie Blue’s Rooms’ is a sublime Instagram account documenting Susie Mears’ London and Suffolk homes. 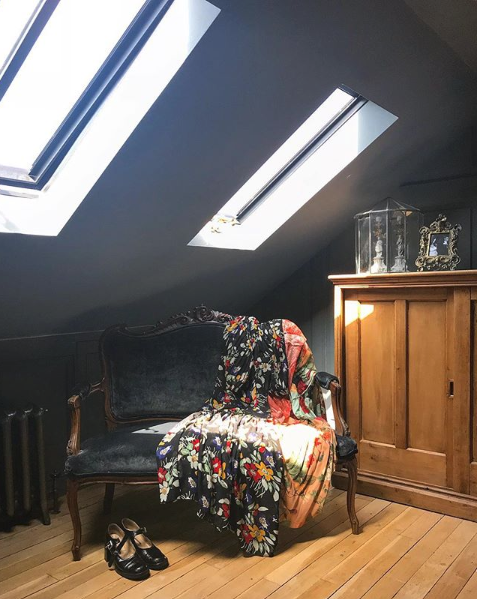 Deliciously dark Victorian inspired decor fills her feed, bursting with unique curiosa and wonderful second-hand finds. We spoke to self-confessed vintage addict Susie about her eclectic look and how to refine your own home style. 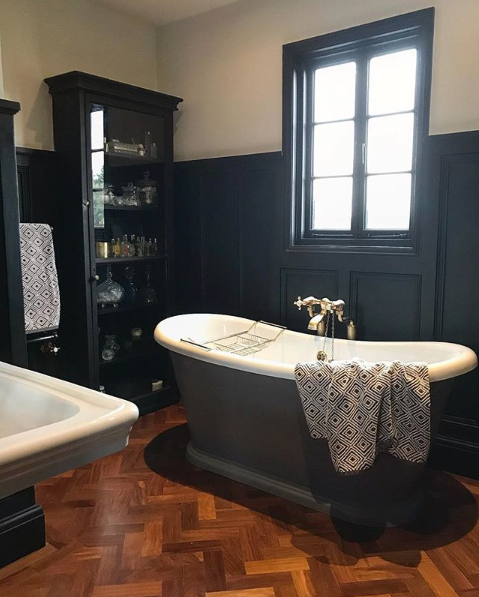 As with many Instagram ‘love at first sights’, we fell head over heels for your bathroom, then even further on seeing the rest of the house. How would you describe your interior style? Thank you and I’m so delighted with how the bathroom turned out. My interior style is heavily influenced by our vintage finds. My husband and I are both admirers and buyers of reclaimed items and we virtually never buy new furniture or pieces for the home. Our style is quite eclectic, rustic, a bit quirky with a touch of old grandeur. You work at Finchley Nurseries, a garden centre in London. How do your plants and perennials play into your décor choices? I don’t think that the plants and perennials influence my decor choices and I haven’t followed the indoor plant trend as its not really me. However, the dahlia field at work stole my heart and when we bought the cottage I insisted on dahlia beds. I have over 30 dahlias and they make the best cut flowers which fill the cottage. Why did you start documenting your home online? I first posted on Instagram a couple of years ago with some photos of the Christmas shop I had set up at Finchley Nurseries. I had no understanding of the whole Instagram thing at all! I then put up a few photos of my Christmas decor as I’m totally obsessed with Christmas. Once we started doing the loft I posted a few pics and found I was really enjoying taking the photos and interacting with like minded people. It is now a daily ritual and I have formed connections with some lovely and inspiring people. Your rooms feel like they contain their own whimsical worlds. What is it you love most about putting together a room? I have been with my husband for such a long time so the rooms have evolved rather than been put together. However when we did the loft it was a clean slate so I loved getting the initial idea and then running with it and this was the paneling. We bought a huge lot of different sizes of Georgian paneling from the auction a year before we started the loft. This was used on every wall in the bedroom and then new head height paneling was used in the bathroom and hallway. This gave instant character to a new build and then buying the old pieces was the fun part. There’s certainly a cosy french farmhouse feel to your home, but woven together with a love for a darker, eclectic Victorian influence. Where do you source most of your inspiration? The inspiration definitely comes from the old pieces we buy rather than online or magazines. When we bought the cottage it had a fitted eighties kitchen which we ripped out. We then bought an old shop counter at the auction and then another 3! It was great fun putting together an unfitted kitchen. We even used an old Victorian workbench to put the kitchen sink on! 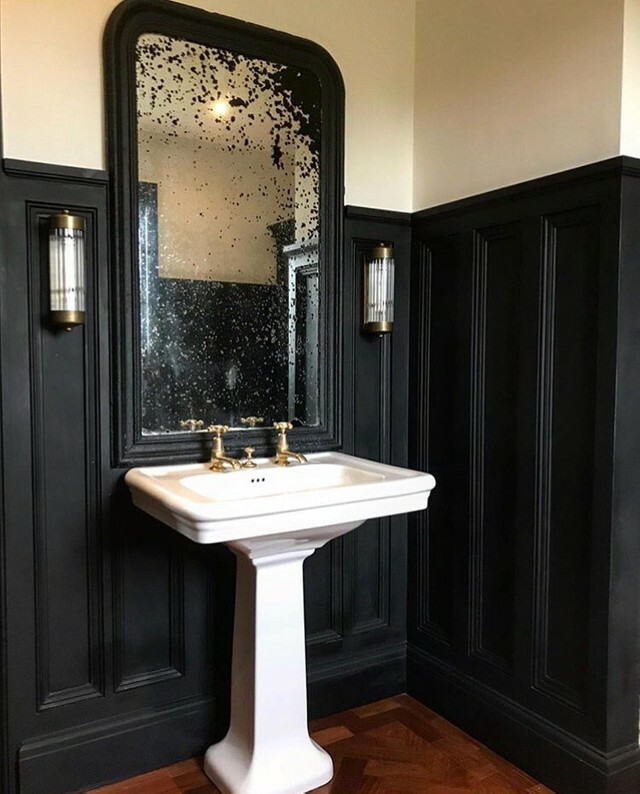 What influenced your decision to go for dark walls? We first went very dark grey in our bedroom ten years ago using a Sanderson paint called Battlement. I’d seen an image of a dark room in a grand old house and loved it. We loved the bedroom so much that the kitchen soon followed and then the lounge. Virtually the whole house is dark and moody now but I’m currently redecorating the kitchen with black woodwork and white walls with the lounge to follow. We love your hand embroidered additions to your displays. How else do you tap into adding your own personality into the home? I make my own cushions so they are always unique and again its by buying reclaimed one off pieces and using them in a different way. We have a large old french cross on our landing, and a large bird sculpture on the floor in the lounge-its always good to have the element of surprise! You are London based, but many of the images are shot in your gorgeous second home in Suffolk. 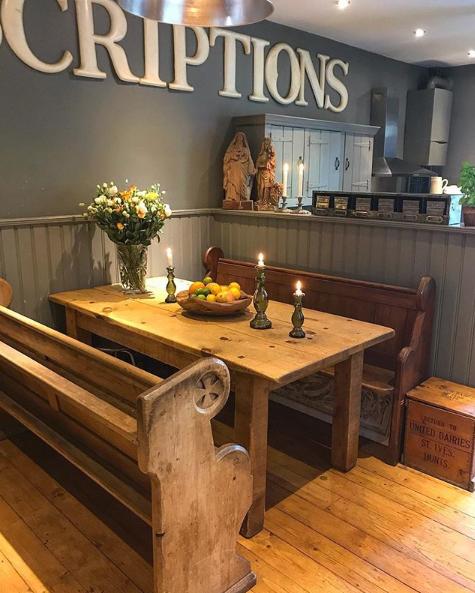 With many incredible vintage finds throughout the home, can you share with us any hidden gems for interior inspiration nearby? A large majority of the furniture in the cottage was bought at TW Gaze auction rooms in Diss. They periodically have an architectural salvage auction where we sometimes pick up special pieces. I also love the yearly antique street markets held in Halesworth, Bungay and Beccles. Do you have any truly unique items in your home that you could never part with? There are a few things that i will never part with. In the cottage we have a hand painted 1930s velvet sofa bought for £60 from ebay – I’ve never seen another one. I also adore our large, old French mirror in our bedroom bought at 4am in the dark at a french market. 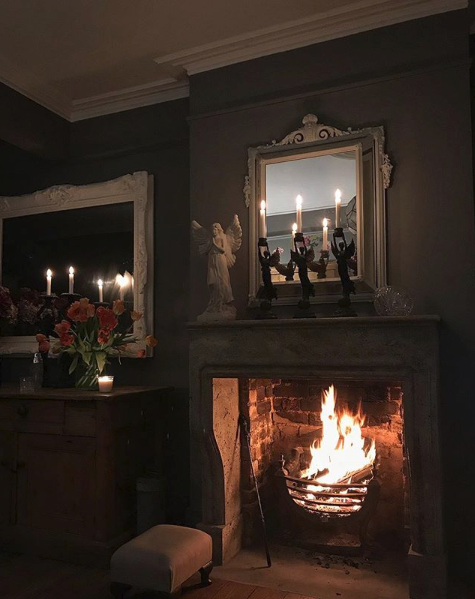 Lastly our heavy, wrought iron angel candlesticks in our lounge which I will never tire of. In your opinion, what are three three key ingredients for creating the perfect home? Firstly, only ever buy things you love – I would rather go without than make do. Secondly, stay true to your own style and don’t just buy things because they are in fashion. Thirdly, get the lighting right! Last but not least, what’s next for ‘susieblues-rooms’? Follow Susie’s interior transformation on Instagram at @susieblues_rooms. To see more of our unique bathroom lighting like Susie’s, browse here.